My story all started with a coral donation from a fellow New Jersey reefkeeper. 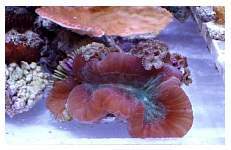 He was donating a brain coral, some zoanthids, a rock full of Ricordea and some small-polyped stony coral fragments to the New Jersey Reefers Club. Our club had been trying to raise money to acquire non-profit status and raffling corals provided the most income toward this end. A club officer picked up the donation without telling the rest of the board. All the fragments were never documented for inventory; he just mentioned that he had picked them up already. A few days later the donor asked how they were doing, and then gave the club an inventoried list of what we should have received. His list did not match that of the club's officer. It appeared that the officer may have taken some of the corals for his personal gain, thinking nobody would notice. He also made the mistake of photographing his new acquisition, a large piece of live rock with 10+ Ricordea specimens. on it. The donor then identified the rock as his. This so-called "acquisition" was foolishly placed into his one-month-old 125-gallon tank, thereby leading to the Ricordea's untimely demise. Under pressure from the officers and members over what he did, he resigned his position and handed over what remained of the donation to me. I received a few fragments, all under one inch high, a small piece of rock with one Ricordea on it, and a brain coral which looked like a dead skeleton simply hosting several small zoanthid colonies. The fragments were handed to me in Ziploc bags and when I first saw them, and given the shape they were in, I didn't think any of them would survive. During dinner that night, I drip acclimated the corals. The water volume was tripled, dumped out and tripled again to make sure they weren't stressed any more than necessary. The acclimation process took a total of 2 ½ hours. I also took pictures to document their arrival. My 75-gallon display houses over 40 coral fragments and mini-colonies of small-polyped stony corals. I have a very light fish load, and I feed them every other day. Plumbed to this is a 28-gallon custom acrylic tank used for growing coral fragments. It shares a sump, skimmer and calcium reactor with the main tank. I started the fragment tank because I wanted to keep more corals than my main display could handle. It was also a good place to culture fragments since it gave them more room to grow, and I usually end up accidentally breaking a few pieces during normal tank maintenance in my main display anyway. The fragment tank houses a SEIO M1100, a Maxijet1200 and a single 6500K Iwasaki bulb. It also has two tiers of "eggcrate" racks. The top one sits a mere 12" from the halide, and the second one about 20" from the light, and is elevated from the bottom of the tank with 2" PVC legs. The light in the fragment tank stays on for only six hours as the tank catches some light from the main display, which sits just four inches to its left. The main tank uses two Tunze 6000's for circulation, and both tanks share the same return pump from the sump. The fragment tank's feed is "tapped" from one of the returns leading to the main tank and is regulated with a ball valve. The fragment tank has a turnover rate slightly under 150 gallons/hour. The calcium reactor is a single chamber second-hand Advanced Reef Technologies K2R. It contains ARM media, and its effluent runs about 50 ml/min at about 60-80 bubbles/min. All top-off for the system is performed manually with kalkwasser that is dripped by a modest 2.5-gallon Kent Marine Aquadose unit. I have also started dosing Turbo Calcium on a daily basis to see if I notice any growth spurts. I add carbon on an "as needed" basis, usually 1-2 cups every three to six weeks depending if I forget to change it. I also run a small bag of Kent Phosphate granules, just because I happen to have a gallon's worth of media handy. I also add about a tablespoon of Kent Marine Essential elements every time I do a water change or add carbon to the system. To be honest, I was never a big fan of testing and checking water parameters. I DO try, however, to keep up with my husbandry. My routine consists of 10-15% water changes every two weeks, weekly detritus siphoning, ensuring that the calcium reactor's effluent drips to my satisfaction, etc. As mentioned before, I don't have a heavy fish load and I feed sparingly. The last time I checked my water, ammonia, nitrites, and nitrates were undetectable, while phosphate was almost so; the pH was 8.2, alkalinity was 10 and calcium constantly fluctuated between 350ppm and 410ppm. My salt choice is TropicMarin Pro. I feed the fish a mixture of Mysis shrimp, grated shrimp, clam and garlic, Ocean Nutrition Formula A, Formula B and bloodworms. Preparation involves defrosting a pack (or two) each of Formula A, B, Mysis and bloodworms and then mixing them with the grated garlic, clam and shrimp. I find that grating the shrimp, clam and garlic provides a better "texture" that my fish love, rather than the "mush" associated with using a blender (plus I don't have one). I leave this concoction in a sieve for at least an hour or two in the refrigerator. I do this to get rid of excess moisture in the food, and doing so provides a more "potent" rather than diluted mix. I feed the fish via a "feeding tube" to further reduce excess waste, and to target feed anything that needs it. June 28, 2005. After finally admitting that he may have misunderstood the intended donor, the corals were returned to the club and directly to me. The brain coral arrived at my place in a half-pint Ziploc bag and I almost threw it away. Not only did it look pretty bad, it also was producing quite a bit of mucous, probably as a reaction to the zoanthids that were growing on its skeleton. I thought to myself, "This coral probably isn't going to make it. I'll just throw it into the tank since I don't have time to pick the zoanthids off tonight." I was actually intending to save the zoanthids that had encroached upon its dead coralline-encrusted skeleton. 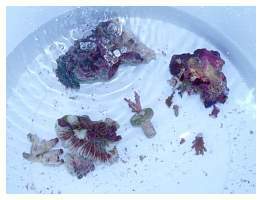 "So much for saving this coral," I thought; "let me drip acclimate all of them in the same bucket while I have dinner." The brain was placed in the fragment tank 8" in front of the SEIO powerhead with its back towards the stream of water. The tissue had so receeded, I just wanted to make sure that water circulated through its semi-lifeless skeleton. I also placed it just under the second-lowest rack, under very low light. 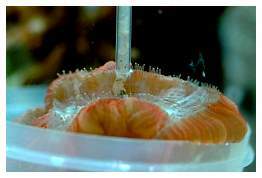 July 4th, 2005: Finally, the brain coral showed polyp extension after two weeks. I noticed the polyps would extend every time I fed my fish. 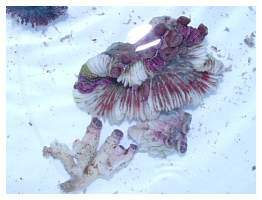 Only 4-5 polyps came out, and I was astonished to see it responding to organics in the water column (most likely the shrimp and clam residues). I decided to try to feed it some excess "juice"
the brain liked it! I guessed it was going to try and take a shot at life after all. July 30th, 2005: The brain had made an absolutely phenomenal comeback. It had also started splitting in two. The attached zoanthids were also making a comeback. I could see a few of them encroaching closer to the front of the brain, which the brain responded to by withdrawing I left it alone for a few days, in the meantime contemplating what to do with the zoanthid hitchhikers. The feeding continued on a daily basis at this point, and I started giving it larger chunks of food, up to 1/8" pieces. I wanted to experiment with improving the colors of my corals, since they have always looked little pale. A few threads on Reef Central had mentioned a possible correlation between dissolved organics and color in small-polyped stony corals, so I figured I'd give it a try. I purchased three Anthias at my local fish store, and they gave me an excuse to feed the tank every day. So it began. 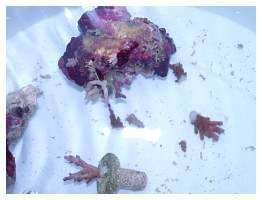 August 11th, 2005: I asked permission (from the board of the NJ Reef Club) to relocate the zoanthids on the back of the brain, to give the brain more room to expand when it fed. The smaller brain fragment had also completely separated from the main colony, and removing the zoanthids (later on) seemed to make it perk up. 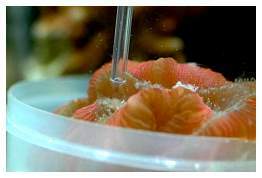 I had to manually clear the grooves of the coral by squirting water on them with a turkey baster, as they seemed to collect detritus on a regular basis. Cleaning the grooves resulted in much better tissue extension, so I figured that the coral was getting insufficient current flow over/through it. September 5th, 2005: The brain was on its way to a full recovery. The flesh that was receded in the original pictures was now all thick and expanded, and the second fragment was also sporting some very healthy flesh as well. Both corals were fed on a daily basis with the same fish food concoction, and I would also occasionally throw in a piece of mashed shrimp as a treat. They definitely loved that stuff. The brain coral was moved a little higher up to the second rack, but still kept away from under the Iwasaki bulb. 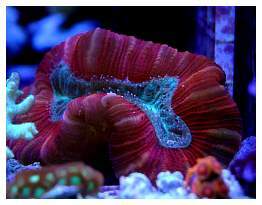 September 21st, 2005: The brain coral was back! It had recuperated nicely under the 6500K lighting, so I decided to throw a 14K bulb over the fragment tank to see if it would change color at all. Whether it was due to the new lighting or the increased health of the coral is unknown, but its reds became more pronounced under the 14K, and after two weeks it looked even better than it did when I acquired it. We decided that the brain was to be raffled off for the October meeting, and I made preparations to keep it in good shape. I moved it a little closer to the light source and fed it sparingly twice a day. I think it responded better to two feedings than one big one, but due to my work schedule, the feedings were necessarily inconsistent. I did see a marked improvement in the smaller of the two; it was definitely trying to re-occupy the calcium skeletal structure it had once covered. 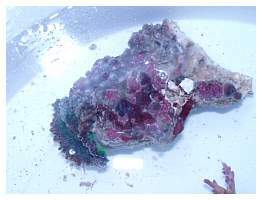 The polyps extended further now as well, and the colors were definitely starting to get deeper. My tank was also exhibiting deeper colors, attesting to the fact that dissolved organics (in the appropriate amount) did elicit eye-pleasing color even in a tank dominated with small-polyped corals. 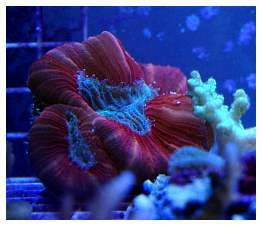 October 12th, 2005: The brain coral was raffled off and won by Steve68. Long Live the Brain!